Do any of you have a drawer that looks like this? The dreaded second drawer? The drawer that just refuses to be tamed? Or have I just totally embarrassed myself? What's even more embarrassing, is it's been this way for years ... many years. Seriously uncool and seriously unorganised making it very hard to find things, a danger to little fingers that like to explore these strange, exotic places and a happy haven for unused utensils - all taking up valuable space. So, enough was enough. It was time to call in the big guns. 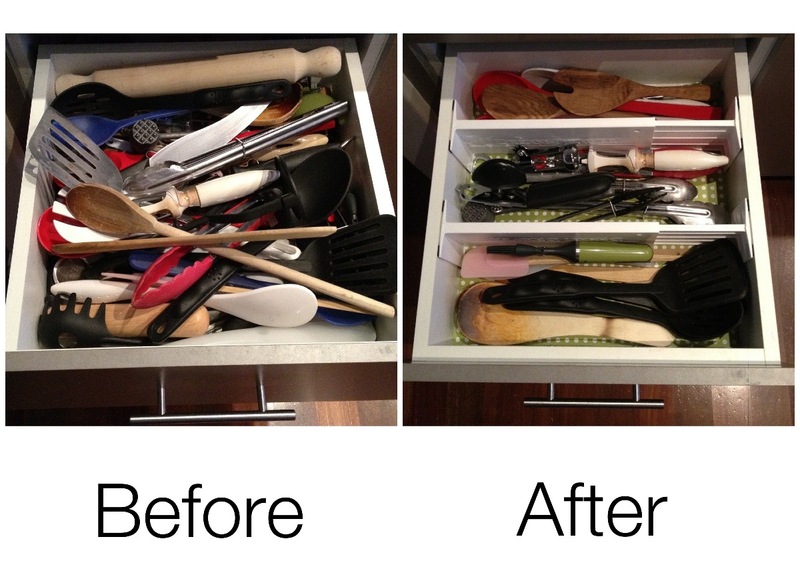 Drawer separators! So basic, so easy and cheaper than some of the drawer tidy's I came across, plus this way I could control exactly where I wanted them and which way they sat. I chose to place them horizontally so that anything sharp could be placed at the back - well away from those "little explorers" I mentioned earlier (whose sticky little fingerprints you can totally see all over my drawers!). They are also spring-loaded so are a perfect snug fit. Happy camper. And because I am a bit of a sucker for nice paper and "prettifying" things, I decided to take the whole drawer-tidying thing up a notch and line the drawers with some leftover scrapbooking paper I had (I don't actually scrapbook but I can't go past the scrapbooking aisle in Spotlight without buying a few sheets - which is a good thing because then I have a little supply on hand when I get all nerdy on myself!). I also lined my cutlery drawer with the same paper last year so, well, it had to match, didn't it?! So, now my boring little drawer looks all tidy and fresh and has been given a bit more life with the added paper and when the paper rips or gets dirty, I'll just replace it with another stash. The cutlery drawer has been lined for about a year now and is still holding up perfectly plus every time I open it I can't help but think how cute it looks! The whole mini-project took about 20 minutes and the kids had fun running around with the various "swords" and "wands" that were headed for the bin. Talk about a super quick fix for something that has bugged me for years. A little bit of quiet + a tiny amount of organisation = big gratification. Question is....will it stay that way?! I'm forever organising that draw but ny husband never puts things back where they belong and then it's right back to square one! Awesome!!! Love your idea and I've heard you can get those separators from the Reject Shop. Every time I go to Target I pick up the drawer organizers and stare at them for 5mins but just not convinced they will fix the problem or even fit properly. This job is now on my list for the weekend, including the funky liners too, thanks!! !